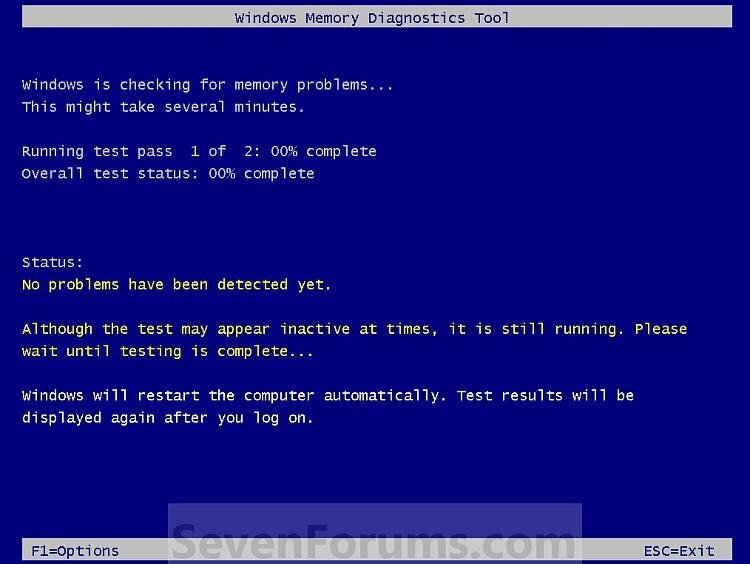 This will show you how to run the Windows Memory Diagnostic Tool to test the Random Access Memory (RAM) on your computer for errors in Windows 7. The diagnostic includes a comprehensive set of memory tests. If you are experiencing problems while running Windows, you can use the diagnostic to determine whether the problems are caused by failing hardware, such as RAM or the memory system of your motherboard. If you suspect memory issues, then you may also want to consider using and running Memtest86+ at boot. Memtest86+ is a comprehensive stand-alone memory diagnostic program that you boot from at startup to test your RAM. You can download a ISO file to burn to DVD to boot with, or a floppy disk package installable from Windows to a USB flash drive or floppy disk to boot with. It could take a long time (several hours) for the Memory Diagnostics Tool to finish running depending on how many passes you set, and if there are any issues found. NOTE: Start with either step 1, 2, or 3 for how you want to start the Memory Diagnostics Tool. A) Open the Control Panel (icons view). B) Click on the Administrative Tools icon, and click on Memory Diagnostics Tool. C) Go to step 1F below. D) Open the Start menu. G) Go to step 4. A) Boot into the Advanced Boot Options screen. A) Boot into the System Recovery Options screen. 4. The computer will now restart, and you will see this screen next. (See screenshot below. NOTE: Windows Memory Diagnostic Tool will run the Standard test by default. A) Go to step 6. NOTE: If you have a multimedia keyboard, then you may need to press the Function (F-Lock) key for F1 to work. NOTE: Press the Escape (Esc) key if you do not wish to make any changes to the options and return to the screen below step 4. NOTE: If errors are found, the Windows Memory Diagnostics Tool will attempt to determine which particular memory module in your computer is causing these errors. If that information is available, it will be stated in the results after you log on from the restart. If bad memory is found then you will need to remove and replace the bad RAM module. 7. You can also read the Memory Diagnostic Tool system log in Event Viewer. Windows Memory Diagnostics Tool will not stop running been running all night and this morning still running how can i stop it. Other Info 1 + 1 = 10b, 7 + 7 = 16o, a + b = 15h. Hello Thumper, and welcome to Seven Forums. How about Task Manager. Pull's me out sometimes. after the first 'Esc' stopped the 'scan-in-progress'? Did you have computer power 'on' when you yanked the memory boards? directx Diagnostics tool stopped working?